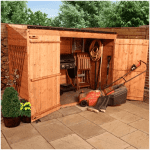 A fantastic sentry box shed, particularly suited for tall items such as garden spades and the like, if you are looking for a compact storage solution for your garden then this could be just the item you are looking for. This is a really special storage box, it is incredibly stylish yet still practical and is constructed from strong, durable wood which is both hard wearing and long lasting. 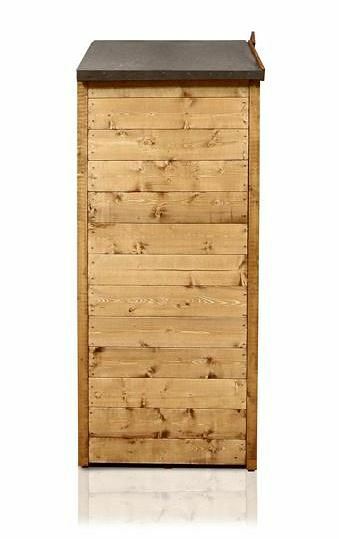 The tongue & groove cladding gives it extra strength and the upright design allows you to store tall pieces of gardening equipment with minimum fuss and as it is tall rather than wide it means that it will fit even in limited spaces. This comes complete with shelving inside. Felt roof and engineered board gives you weather protection and the Apex roof gives it so much visual appeal – a great choice for every gardening enthusiast. 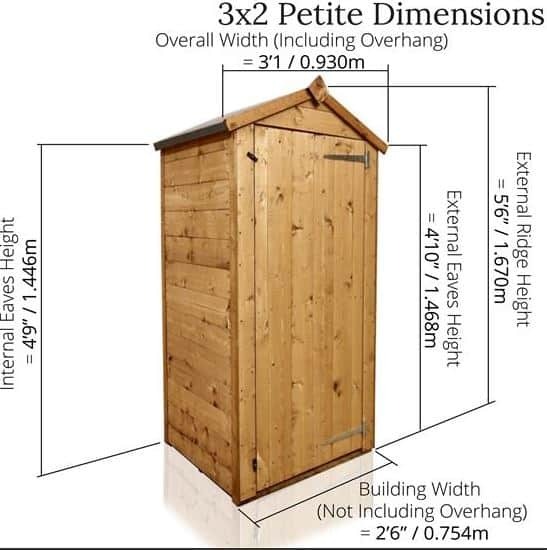 Note this is exactly the same as the other sentry box shed even in size yet price is different! With in-built corner shelving this storage box allows you to store your garden tools and equipment, both big and small. With the option of adding extra security in the form of a padlock, you can be sure that your items will be safe and secure inside. 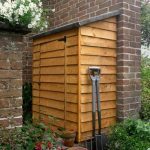 We know that when looking to purchase an outside storage solution for your garden, there are many features that you will be looking for and, as a result, many questions you may need answering. Below we provide answers to some questions you may have during the decision making process. What can I store in it? 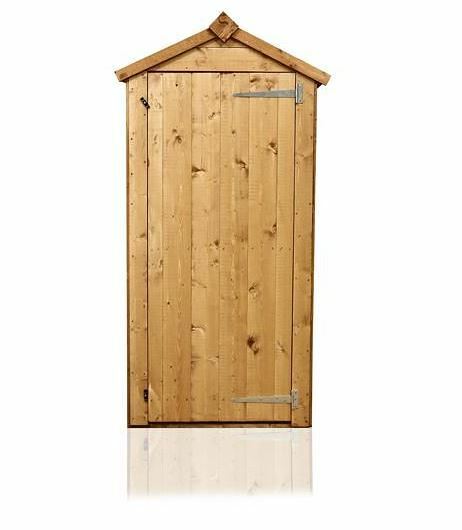 This particular sentry box shed has a tall design, perfect for storage of ladders and gardening equipment such as spades. The large door opening makes it an excellent choice for all of your larger items, however the in-built shelving also provides options for storing smaller items safely also. Does this provide secure storage? This storage box will hold all of your items, protecting them from the wind, rain and harshest weather condition, keeping them dry at all times. If you are looking from more of a security aspect then this particular model does not currently have a lock. However, you may be able to add extra security features yourself if you require the extra peace of mind. Is this a durable product? 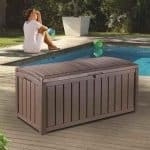 This storage box is designed and built for outdoors usage and so will withstand the wind, rain and snow to protect your items. Made of a solid timber that is robust and built to last, you can be sure you will have this storage box in many years to come. Overall, we think this a fantastic storage solution for your garden equipment and outdoor toys. 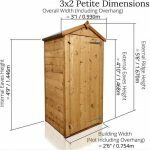 Just the right size for a smaller amount of items or a property with limited outside space, if this describes your situation then this could be a great product for you. 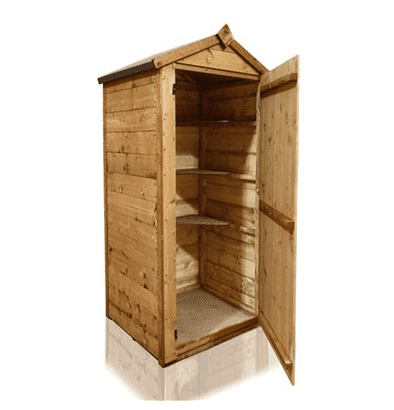 The Billyoh Sentry Box Storage: How easy to build? Being of a relatively simple design and on the smaller side, this model of storage box will only take you a relatively short amount of time to put together. With the only intricate feature being the interior shelves, the storage box itself will be quite straightforward to build but may require two people to handle the large pieces. Basic tools are required but with the instruction manual included, you will be able to follow clear instructions and easy-to-follow diagrams to have this constructed in no time. We expect you will have this built in one to two hours. 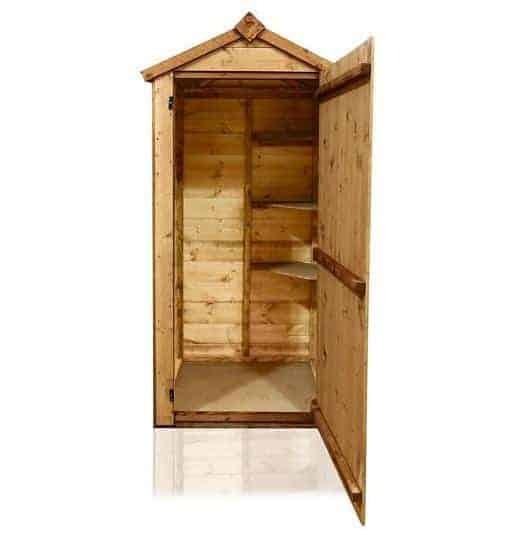 The Billyoh Sentry Box Storage: What is the overall quality like? Billyoh outdoor storage and equipment are designed and manufactured in the UK, meeting the latest EU safety regulations and requirements. The strong timber used in manufacturing creates a box that will weather the storm over many years keeping your possessions safe and dry inside. Just like a shed, this storage box requires very little maintenance and maybe just a hose down with water if it was ever very dirty for any reason. The finish to the exterior of the sentry box shed means that it will look just as good in a couple of years as it does today, it’s smart, rustic appearance never fading. The aesthetic look of this storage box looks like your typical garden shed, however there is the option to paint it to your requirements if you wish to add a little character to your garden. If you are in the market for a smaller sized storage box or only have a small number of items to store, then this storage box could be perfect for you. 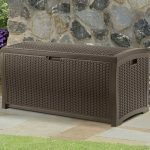 Perfect for the smaller garden or outside space, this comes at a great price for a flexible storage solution. 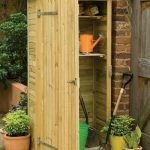 Great value for money and an excellent, top quality design – definitely one to consider in your search for garden storage. This storage box is quite small but I purchased it in hopes that it would at least be big enough for what I wanted to put in it. I got it and put it together, which that part wasn’t bad at all. The stuff I wanted to put in, it did fit. My favorite quality of this storage box is the fact that I can put it anywhere outside, even in a tight corner. Because of the size and the way it’s shaped, you can literally put it anywhere. I put all of my gardening tools, some of my son’s favorite outdoor sand toys that I don’t want to get lost, and some other important things. I don’t have to worry about our belongings getting ruined outdoors now because this is the protection that we need. No matter what type of storm comes our way, I have confidence this will hold up. I can tell it’s made with quality wood and I am glad I made the purchase. I love anything that looks antique but isn’t, because it’s the same effect at a fraction of the price. That’s why, when I saw the BillyOh Sentry Box, I just knew I had to have it. 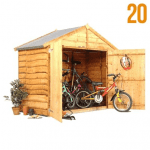 It’s perfect for storing longer objects like rakes and spades, and it stands beautifully in a corner of the garage. Since it is vertical, it barely takes up any space, and the shelving inside allows me to store smaller objects beside the longer ones, making it a perfect accessory for a garage or shed. It’s very affordable, and the wood is of the highest quality, so I know this was a very purchase. I’m very happy with the sentry box, and I’d recommend this to anyone searching for a cheap and stylish way to store garden tools.